I had been worried, dreading the need to develop a strategic plan. But, in what my manager shared with me I found hope. It seemed easy enough and it was. And after that first plan was done. . .I felt comfortable. There was even a satisfaction that accomplishing the plan’s goals wouldn’t be too hard. Fast forward to today. 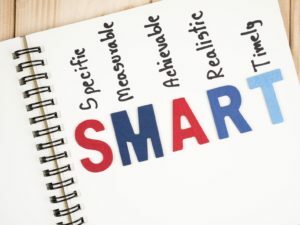 I have a very different perspective on what embodies “SMART” goals. Why? Because when an organization puts together a plan with “attainable” goals, it often artificially limits what the organization can accomplish. Attainable sets the tone by saying goals should be “within reach” or “achievable” which stands in contrast to the intensity typically associated with the vision an organization first establishes at the outset of the strategic planning process. Attainable is the small fish sitting in a river waiting for food to be carried to it. Is it strategic? Sure. . . Is it certain? Yes. . . But is the fish achieving more than basic survival? No. . .
Attainable is the small fish sitting in a river waiting for food to be carried to it. Is it strategic? Sure, the fish has chosen to save energy and capitalize on what can be seen. Is it certain? Yes, inevitably food will come downstream. But is the fish achieving more than basic survival? No, the fish isn’t taking any risk to find a better source of food and pursue its vision of being the “big fish” someday. The alternative goals are those that are ambitious. Meaning they require greater effort and ability to be successful, but nonetheless can still be successful. The bottom line is this: focusing on attainable goals is still a strategic decision, but its a strategy that focuses on accomplishing obvious outcomes that would be nearly impossible not to reach. That’s great news for the individuals charged with being responsible for implementation. However, its bad new for growth. Judging goals on a criteria of “realistic” also artificially limits what can be accomplished. Because the opposite of reality is fantasy. And fantasies are categorized in our minds as wishes and falsehoods, making the use of imagination a bad thing. As soon as someone says, “the reality is that this will be difficult. . .” in a strategy session, a group will navigate away from talking about ambitious goals that require more intense analysis and resources. Viewing strategy and goal setting through the lens of reality therefore becomes an opportunity to back down from a challenge. In fact it’s the last opportunity to make a U-turn in the planning process and return to a place of comfort. So what does a more successful approach look like? The answer was clear to those directors. The purpose of the organization was to be transformative and impactful. In that context they had to redefine what success would look like as they developed their plan. Success couldn’t be about measuring and accomplishing every goal in the plan. Instead, it had to be about realizing their vision to be something different down the road. To make that happen, being ‘realistic’ meant having a discussion about risks, resources and a range of results as opposed to dismissing an aggressive, ambitious goal as being a fantasy because it’s cutting edge, innovative or imaginative. Tagged about planning myths, business, business management, consulting, economic development, goal setting, government, project management, S.M.A.R.T., small business assistance, smart goals, strategic planning, strategy. The Toyer Framework® is a registered trademark of Toyer Strategic Consulting, LLC. Micgrowpolitan™ is a trademark of Toyer Strategic Consulting, LLC.